House mice have an adult body length (nose to base of tail) of 7.5–10 cm (3.0–3.9 in) and a tail length of 5–10 cm (2.0–3.9 in). The weight is typically 10–25 g (0.4–0.9 oz). In the wild they vary in colour from light to dark agouti (light to dark brown) but domesticated fancy mice and laboratory mice are produced in many colours ranging from white to champagne to black. They have short hair and some, but not all, sub-species have a light belly. The ears and tail have little hair. The hind feet are short compared to Apodemus mice, only 15–19 mm (0.59–0.75 in) long; the normal gait is a run with a stride of about 4.5 cm (1.8 in), though they can jump vertically up to 45 cm (18 in). The voice is a high-pitched squeak. House mice thrive under a variety of conditions: they are found in and around homes and commercial structures, as well as in open fields and agricultural lands. House mice can sometimes transmit diseases, contaminate food and damage food packaging. Although the American CDC (Centers for Disease Control and Prevention) gives a list with diseases transmitted by rodents, only few of the diseases are transmitted through the house mouse. These are not commonly reported infections in humans and most infections are mild and are often never diagnosed. House mice usually live less than one year in the wild, due to a high level of predation and exposure to harsh environments. In protected environments, however, they often live two to three years. The Methuselah Mouse Prize is a competition to breed or engineer extremely long-lived laboratory mice. 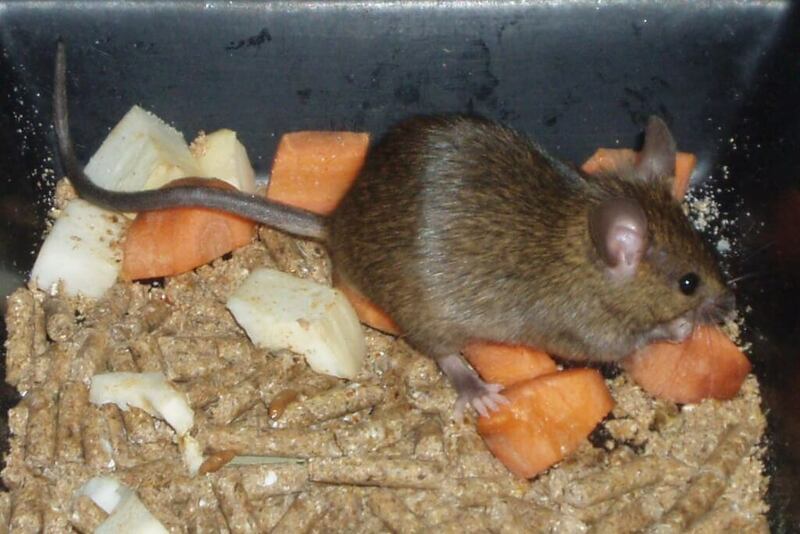 As of 2005, the record holder was a genetically engineered mouse that lived for 1,819 days (4 years, 358 days). Another record holder that was kept in an enriched environment but did not receive any genetic, pharmacological, or dietary treatment lived for 1,551 days (4 years, 90 days). Female house mice have an estrous cycle about four to six days long, with estrus itself lasting less than a day. If several females are held together under crowded conditions, they will often not have an estrus at all. If they are then exposed to male urine, they will come into estrus after 72 hours. Male house mice court females by emitting characteristic ultrasonic calls in the 30 kHz–110 kHz range. The calls are most frequent during courtship when the male is sniffing and following the female; however, the calls continue after mating has begun, at which time the calls are coincident with mounting behaviour. Males can be induced to emit these calls by female pheromones. The vocalizations appear to differ between individuals and have been compared to bird songs because of their complexity. While females have the capability to produce ultrasonic calls, they typically do not do so during mating behaviour. The pups are born blind and without fur or ears. The ears are fully developed by the fourth day, fur begins to appear at about six days and the eyes open around 13 days after birth; the pups are weaned at around 21 days. Females reach sexual maturity at about six weeks of age and males at about eight weeks, but both can copulate as early as five weeks. If the infants live in high temperatured area from birth, they will become less-haired.